Shrub or small tree; lvs long-petioled; lfls sessile, ovate or elliptic to rhombic or ovate-oblong, the lateral ones oblique; cymes 4-8 cm wide; pet oblong, pubescent, 4-7 mm; filaments pubescent; fr 15-25 mm wide, reticulate-veiny, with the odor of hops; 2n=42. Moist or rich woods and thickets; widespread in Mex. and sw. U.S., n. and e. to Kans., s. Wis., s. Mich., O., N.C., and Fla., and irregularly to s. Que., Vt., w. N.Y., N.J., and Va. May, June. Our plants all belong to ssp. trifoliata, most of them to the glabrous or inconspicuously pubescent var. 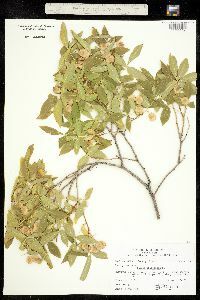 trifoliata. The mainly more southern var. mollis Torr. & A. Gray, with the lvs and twigs evidently pubescent, the lvs densely so beneath, extends n. into our range as far as D.C. and is disjunct on sand-dunes along the s. shore of Lake Michigan, where it has been called var. deamiana.